Burn calories and have fun, all at once. If you've been struggling to be diligent with going to the gym or attending group fitness classes, imbuing your movement practice with a sense of play could just be the thing you need to get going — and keep going. We all have different things that make working out more enjoyable for each of us, and bringing back the sense of playfulness with this Crossrope Get Lean Jump Rope Set could be just the thing you need. Here are a few quick statistics for you: jumping rope burns more than 10 calories a minute, all while toning your legs, glutes, shoulders, and arms — not to mention the cardiovascular benefits. Just think, you can burn more than 200 calories in two 10-minute sessions each day with an average jump rope — so imagine what happens with this set. It includes interchangeable, beginner-friendly light and more challenging heavy ropes that delivers a fun and challenging workout every time. 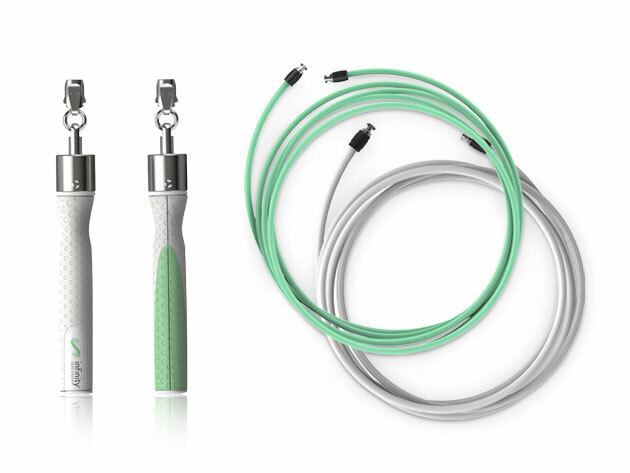 Both types of jumping ropes are made with a proprietary coating that prevents tangling and lets you jump on any surface — perfect for impromptu sessions on a grassy lawn or even in sand. There's also the companion app, which gives you access to a wide range of workouts, tutorials, and challenges that keep you interested and engaged. It might be the simplest way to get a full-body workout: usually this Crossrope Get Lean Jump Rope Set is $88, but you can get it here for $67.